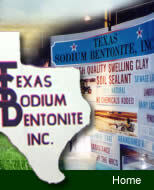 Texas Sodium Bentonite - About Texas Sodium Bentonite, Inc.
About Texas Sodium Bentonite, Inc.
Texas Sodium Bentonite, Inc. is a well established company that services new and expanding markets throughout the US and abroad. We are one of the few companies that conduct its own mining operation as well as handling marketing and sales directly. Through continued testing with multiple independent labs in conjunction with our own onsite testing, we strive to produce the most consistent, highest quality material possible. Our company does this while still maintaining an all natural product with absolutely no chemical additives. 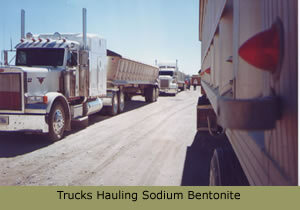 Texas Sodium Bentonite's main focus is on providing a quality product, competitive pricing and unsurpassed customer service. We appreciate the opportunity to serve our customers. What Makes Us A Cut Above All The Rest? 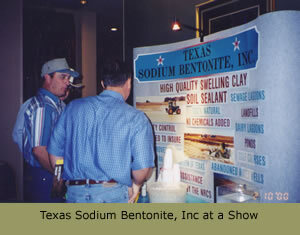 Texas Sodium Bentonite, Inc. is the oldest and one of the largest producing sodium bentonite plants in Texas. Our products are tested by Independent Labs to insure their quality. We are dedicated to producing a high quality product at the very best price. We provide on site assistance to determine if our product is needed. If our product is needed, we can assist in determining the amount of sodium bentonite needed based on your soil type and the area coverage. We have soil consultants and a soil scientist working with us to help trouble shoot problems that may arise. We work with experienced heavy equipment operators all over the state of Texas and can assist in recommending an operator for the bentonite distribution. We are an honest, dependable, hard working company and would like to earn your business.